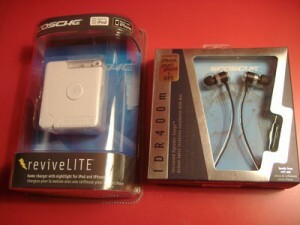 I’m very pleased with the turn-out for comments and tweets for the Scosche Reviews Contest, I’m sure you’re all waiting on pins and needles to find out who won the ReviveLite and the IDR400m Headphones. First off, props to Nutchos for coming up with with a hack-job of using the iPhone for an alarm right by the bed. Hopefully you can still find a use for the nailed-to-the-wall basket now that you’ll have a ReviveLite to charge and hold your iPhone! And now for the big winner of the IDR400m Headphones/mic – Justin S. Congrats! I appreciate all the comments and tweets, and hope everyone seriously considers going to pick themselves up a pair of these really great headphones, you won’t be disappointed. If you have any further questions about the products, definitely contact me or comment below!